As I write this final ‘Internal Thoughts’ blog post, I can’t help but find myself in complete disbelief that this is somehow my last week, my last day actually. It almost hurts to type. I keep saying this over and over again, but how did 10 weeks go by this fast? This summer here at Array has seemed like a dream. There is no way that we are heading towards the end of August and the beginning of my last semester of college as an undergrad. Even though I am sad that this internship is coming to a close, I’m excited to use all of the experience I’ve gained from it towards my future classes and even potential internships or jobs. This internship has given me the opportunity to immerse myself in the unfamiliar. For example, if anyone told me just a few months ago that I would be able to characterize myself as a blogger, I would have probably laughed. Now it’s one of my favorite parts of my job! I’m going to be completely honest – the main reason I applied for this internship in the first place is because I needed internship credit in order to graduate. But another huge reason was because I wanted to get a feel for the real world industry and where I want to see myself in the now very near future. Don’t get me wrong, getting an internship was a requirement, but not a single part of my internship at Array Creative has felt that way. The team here has been nothing short of amazing and supportive of me through this whole experience. I shared my interest in social, creative, and copywriting with Ian and Cathy before even getting hired, and they really let me explore those aspects of Array’s work through blogging, and creating content for their social media. The rest of the team also helped to submerge me in things I wasn’t very familiar with, like SEO for the site and research on social content for our real clients. Being able to explore all these different aspects has not only given me confidence for my future, but also ideas of what I want to do with my career in advertising. What better way of figuring out what you want to do than testing the waters? 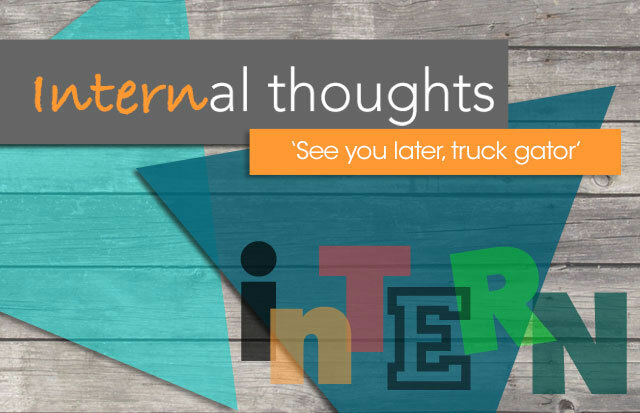 Don’t Wait – It’s never too early to start looking for internships. One of the biggest regrets I have is waiting so long to apply. It doesn’t matter what year you are or how many classes you’ve taken – it never hurts to apply. Someone will take notice in you. Get Your Feet Wet – (not literally, that’s weird) But seriously, don’t be scared to try/learn something new! You never know, you might love it. Even if you don’t, you at least have more experience to add to your resume or portfolio! Be Yourself – The thought of interviewing or your first day can be nerve wrecking, but I found out fast that letting your personality show is extremely important. Not only because you should always be yourself, but also because it’s important to see if you’re compatible with your potential employer. But in all seriousness, it really has been a pleasure.